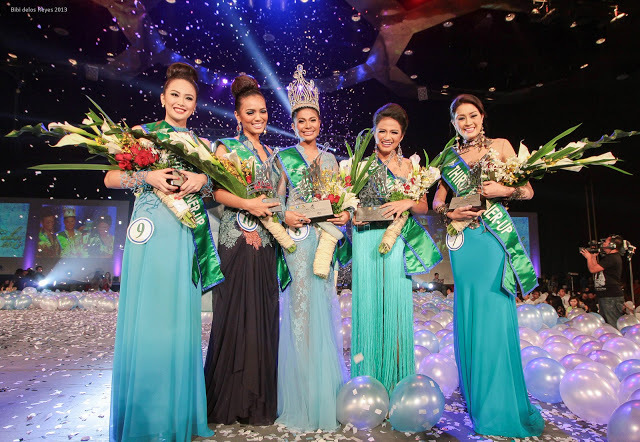 Last night, January 16, 2013 was the pageant and coronation night of the Miss Cebu winners for this year 2013. I was watching it live on TV that night shown at Studio 23 Live from the Pacific Grand Ballroom Waterfront Hotel and Casino here in Cebu City. The event was hosted by Andrew, Ma Elena, and Karla Paula Henry two beautiful ladies and one smart and gorgeous guy. Twelve lovely candidates coming from the different regions of Cebu vied for the title. And the winners wearing the color for 2013 Emerald Green. I really adored the gowns designed by Cebuano designers, definitely World Class! #8 Namrata Neesha Murjani !!! As Ms. Cebu 2013, Murjani won P60,000; trips to Hong Kong, Europe, Las Vegas and the Holy Land; and overnight stay at Harolds Hotel, Crimson Resort and Spa, Marriot Cebu City Hotel, and Marco Polo Plaza Hotel. Murjani, a 19-year-old Biology student from the Cebu Doctor’s University who is also celebrating her birthday today, will also be taking home a digital camera and was also awarded with voice and stage performance lessons courtesy of the Center for Pop Music. Murjani was also awarded the Best in Evening Gown and Miss Megaworld. Her gown designer is Carrie Santiago. They're very convincing and can definitely work. Nonetheless, the posts are very short for newbies. May just you please prolong them a little from next time? Thank you for the post. A lot of times it's challenging to get that "perfect balance" between usability and appearance. I must say you've done a superb job with this. Your means of telling everything in this paragraph is truly fastidious, all can effortlessly understand it, Thanks a lot. the favor”.I am attempting to find things to enhance my web site!